We’d love to take care of your media content strategy to deliver a power-packed suite. Our in-house team, ever-evolving learning curve, and impactful infrastructure drives your platform to become a remarkable engageable and monetizable dais. To deliver enterprise-grade, lightning-fast video & audio streaming from end to end. Vplayed gives you a choice of customising on any end - from designing UI to embedding backend detailings. 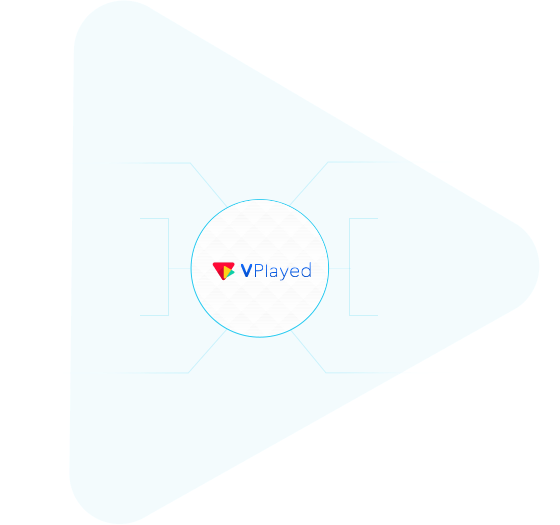 Designed with an eye to proliferate ROI, Vplayed has equipped with subscriptions, ads, transaction and much more. Fortify your data files intact from fringe factors on all fronts. DRM, access control and encryption prevents your app from security breaches. Eminent content management system gives ground to rapid HD streaming. Channel streaming applications with zero buffer. Deliver UHD streaming at minimal costs, and hit high reach by employing state-of-art content delivery network model. The HLS player developed by Vplayed gives you a thoroughly customisable, compact video hosting experience that makes streaming HD videos at ease. Get instant updates on the climate your app resides in. From comparative study to current viewership stats. Max out viewership reach with features like viral social outreach, content/target marketing, and suggest algorithms. Strategically placed on preroll, midroll or postroll according to the performance of videos brings out the most in revenue. Bag astounding revenue by delivering enticing coupons and promotions relevant to your customers. Carefully drafted attributes to make streaming reachable to all classes. A reliable solution where broadcasters can build their own platform to publish original content on the go. Stay connected to your audience via any device, from mobile journalism to TV subscriptions. Providing movies and TV shows on the go is a proven affluence. Accommodate to the ever-changing screen areas that is viable on any OTT device. Vplayed builds customizable platforms that caters to the needs of tutoring by providing interactive solutions for everything from tutorials, tutor specifics to e-classrooms. A ceaseless streaming solution built on adaptive bitrate technology, thus ensuring the games, podcasts and on-request videos can be streamed live with zero latency. An over-all experience provider with captivating detailings to tackle formal viewerships. Familiarise 3rd party acquaintance with your products through live or on-demand interactive demos, product detailings. Live streaming expands viewer base for any organisation and creates viral content that works best in the current environment. Let religious worshippers get a step closer to god at their place of convenience through streaming sermons, ceremonies and holy book readings. A solution to construct definitive platforms where upsurging creative minds can build their own kingdoms and connect to their fanbase in a personalised manner.